1 Pound =$1.10 and €1.03 Coming !!!! Anyone with a UK salary, saving, shares, house or pension is noticeably poorer (... compared to rest of world). I suspect we might yet see parity with Euro once trigger is pulled on article 50 ? The British peso is in freefall vs. international currency. really isnt looking good and pound for euro is looking quite likely by next season. I changed 2000 before the vote as 1.30 was as good as it was getting. We had parity with the € a few years back (2007?). I think we're knackered against the $ (although who knows what a Trump outcome might do? ), but I don't think the € is out of the woods, so our position with it could be short term. A Greece type issue or other countries deciding to re-evaluate their options could affect the strength of the € dramatically. I think we can expect very volatile times - possibly an understatement! Why are you moaning - you can pick your own currency when you have voted for Independence, which would have to be the Euro if you then join the EU as that is non-negotiable for a joining country. He starts his post with "at the close" ?! and said "1 Pound =$1.10.."
OK I confess I do not understansd. What vote was there for independance? The UK has always been an independent country (but perhaps a bit too keen to do the bidding of the USA). And what is the British Peso? @johnE, I was referring to the Scottish Nationalists calling for another vote on Scotland's Independence from the United Kingdom, which may well happen at some time in the future when the price of oil rises to a level where their economic plans may be viable. @chocksaway, I aknowledge that Scotland services a fair bit of the North sea oil industry, but how much actually lies in Scottish waters as opposed to Norway, Zetland and England? The Euro is only held together by Germany. Openly admitting that Scotland has similar oil reserves to Norway with population of just 4 million. Scotland oil will be gone by 2030. 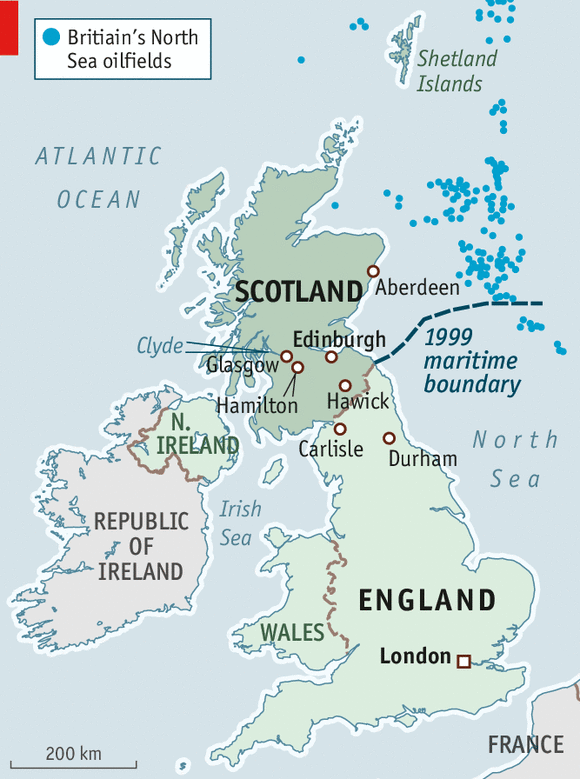 ^ Ha : Originally they told us Scotlands oil would be gone by 1995. Gigantic new fields being drilled in Clair and Lancaster fields (West of Shetland) this week. Well we may all be 20% poorer, there'll be no one to staff the care homes, coffee shops, or restaurants. On the plus side at least we can look forward to a future free of Scotch politicians constantly banging on about Mel Gibson and posh "Brexit" politicians banging on about their country, which most likely will cease to exist thanks to their fine work. Why is this in the piste...havent you got enough going on in apres? 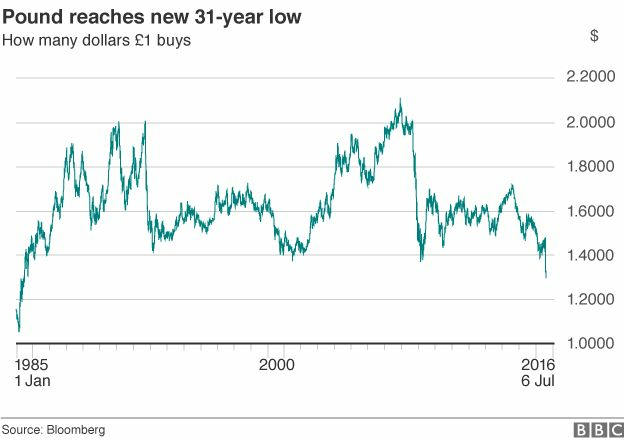 @Haggis_Trap, from what I can make out from your graph, is that the £ has been up and down like a yo-yo for the last 30 odd years, what was happening on the 1st of jan 85 to make the £-$ to be near parity?. in dec 2009 the £ vs the euro was 1.05, (taken from xe currency 10year historic exchange app) I cannot remember then the mass hysteria that is going on now about the exchange rates. from my limited knowledge, it seems that exchange rates fluctuate all the time, and in some cases throughout the last 30years, really dramatically. last year i heard an "expert" on the radio saying she thought the pound was overvalued and the euro should be around the 1.20 to the pound, when it was 1.44.
yes, it is bloody annoying if you are looking to exchange money, but this time last year i was pricing up our ski holiday for last feb and the exchange rate was at its highest, 1.44, when we finally went to pay for most of the things (in the euros) it was 1.30.
our last family holiday to Europe before that was in 2011, and the exchange rate was 1.11!!! in the future i am going to assume that everything is 1 to 1, and if i get a more favourable rate, it is a bonus!!! obviously anyone looking to buy a house etc in Europe at this moment will be on for a bit of a shock, conversely if you are selling up you are on to a winner, as the saying goes "every cloud has a silver lining"
^ If the £ stays low then price in shops / supermarkets will go up. Which leads to inflation, higher interest rates and potentially a self inflected recession. UK ratio of imports / exports is approx 70 :30 - so a weak currency doesn't really benefit our economy. Of course none of this is a surprise : it is exactly what the "experts" predicted would happen immediately after brexit. ^ It is almost certain that a weak £ will lead to higher inflation (and BofE likely raising interest rates on your mortgage). That much is indisputable and basic economics. The sky wont fall in, but the economic effect of Brexit is very real and will affect the man on street. Maybe. Maybe not. But blaming Brexit is not necessarily correct. As the title says and to stick to the relevant topic. Yes in my case next season is going to be "a lot more expensive"
Its getting more expensive by the week and with zero forward planning or exit plans then its going to get much more expensive by December. that affects me a lot and i am concerned so yes this thread has its place , im an enthusiastic skier going for my 1st season! Its unnecessarily got 10% dearer already and could be much more by the time i go. I earn little more than minimum wage , this is unwelcome and as much as i respect "democracy" , failure to have an exit plan is a pure disgrace and all the architects who have ran off to protect their own salaries and wealth should be ashamed of themselves. @hawkwind, agreed — if you are on a tight budget, then these things really add-up. Are you going for a whole season? Will you be working in a French or Austrian resort etc? In which case you will be paid in Euros of course, so that should help. If you are just going for 1 or 2 weeks, then you might consider booking an all-in package deal, with flights, accommodation, ski-rental, lift pass etc. The price will be in UKP, and fixed. It could be said that the costs are just returning to 2007/08 levels and that we've just had a few cheap years of course! (lightsbluetouchpaper)..
Be careful what you wish for. If that comes about the kind of political, social and economic upheaval and chaos which would ensue would probably not lead to good skiing conditions and happy welcoming locals. Or a strong pound, for that matter. Well when I was in Carrefour in Paris (not the cheapest city) things are a lot cheaper than the UK. You can't compare prices against the world average. Better to compare like for Like. Food is cheaper in France. Likewise, in Tokyo, things cost more but in Singapore food is a LOT LOT cheaper. However, if we are a net importer, then it will be inflationary if the pound is relatively low verses our major site to import from. If those currencies are linked to the $ then that is terrible. If it is Eurozone imports, then not too bad, but that is only because the Euro is in as bad a situation as us. Britain is crippled by bad management, bad government, bad productivity, bad education, bad service, bad infrastructure and bad investment. It designs cr*p products delivered by surly workers and absurdly hubristic managers. Debt is a symptom of those failures, not a cause. @Thornyhill, what sort of comment is that? To make myself resoundingly clear. YES i blame politicians such as Nigel Farage and Boris Johnston for stirring up division to suit their own agendas, the exit plan was reported to be a couple of pages long, yes a few pages! Thats some gamble to take and of course having more knowledge of the likely outcomes than 99% of us sitting at laptops they bailed out. Thats some stitch up right there. Further to that , i listened to the experts on a global scale who scientifically gave us analysis and projections of what we were gambling with but thats not as much fun as finger pointing and being ignorant. Further again , destabilisation and division within Europe historically doesnt work out well , yanno for those of us with kids and grandkids , war isnt a game. But yeah , seems all some folk have to worry about is whether other people on internet forums use appropriate capitalisation and punctuation. Some of this is true for some companies and some not true. It depends on the company. I'm sure some people could exchange the USA for Britain in that sentence and point to Detroit. But then again look at other parts of the USA and it doesn't apply. The point could be relevant in some UK industries but in others, your point is nonsense. Now this is just daft. My company are innovators, designers and manufacturers of electronic equipment. We are number one in Europe, and expanding in the USA and Asia. We make the best product in our field, our workers are dedicated and hardworking and our management ethos is "do what is best for the staff" first and foremost. We could do it cheaper in another country, but we manufacture in the UK and export. We are better than our competitors (USA). So blanket statements that the UK makes cr@p products is totally stupid. My stepD is currently working for a UK TO in Greece. She gets paids in £. She has noticed a big drop in her spending power, and says she is starting to struggle a bit (reps aren't the best paid to start with). In Greece! She is now considering a Winter Sun destination rather than ski repping this winter, because with the higher prices in ski resorts she might really struggle to make ends meet. Is it Brexit or just that we are entering into that part of the economic cycle that leads into a downturn irrelevant of party in power, in the eu or out? The remains will blame Brexit, I am not so sure it is Brexit to blame. Coincidence for all those that want it to be Brexits fault though? ... Now this is just daft. My company are innovators, designers and manufacturers of electronic equipment. We are number one in Europe, and expanding in the USA and Asia. We make the best product in our field, our workers are dedicated and hardworking and our management ethos is "do what is best for the staff" first and foremost. We could do it cheaper in another country, but we manufacture in the UK and export. My own company takes on huge corporations from the USA, India, China, and elsewhere, and we kick their back bottoms. Obviously we also employ people who were born in other countries in Europe, but most people who work for us are UK nationals. I guess in the future we'll be employing people from Sunderland do fill their roles. Does anyone really believe that? Given that every economic expert was predicting it would be the first result of a Brexit vote, and given the speed with which it has happened, I don't think there can be much doubt. "general economic cycle" downturns are usually (admittedly not always) rather slower than this has been.